Sour Cream Chicken Enchiladas a quick and easy dinner. Sour Cream Chicken Enchiladas are a favorite of mine. This Tex Mex classic is an easy dish to put together for a weeknight meal. I don’t know about you, but I am always looking for a new way to prepare your basic chicken breast. I think that chicken breasts are wonderful because you can use them in so many ways. In Texas, we have an abundance of Tex Mex food. I got the inspiration for this recipe from many of the dishes that I so often find in Mexican restaurants. If you don’t want to use a can of enchilada sauce, or if you can’t find one in your local store you can use my recipe for El Chico Enchilada Sauce. For this recipe I am going to cook the chicken breasts right in the enchilada sauce, this helps season the chicken perfectly. You can use leftover cooked chicken if you have some on hand. For this recipe I am using flour tortillas, my stores carry flour tortillas that you cook at home. If you don’t have these you can use other flour tortillas. If you need to be gluten-free you may want to use corn tortillas both work well. When using corn tortillas I like to cook them a moment or two in hot cooking oil. I find this brings out the flavor of the tortilla. You can put these enchiladas together in about 30 minutes. Add some refried beans, and some salsa and chips you will have a wonderful quick and easy dinner. Are you looking for more enchilada inspiration? Be sure to check out these enchilada recipes. 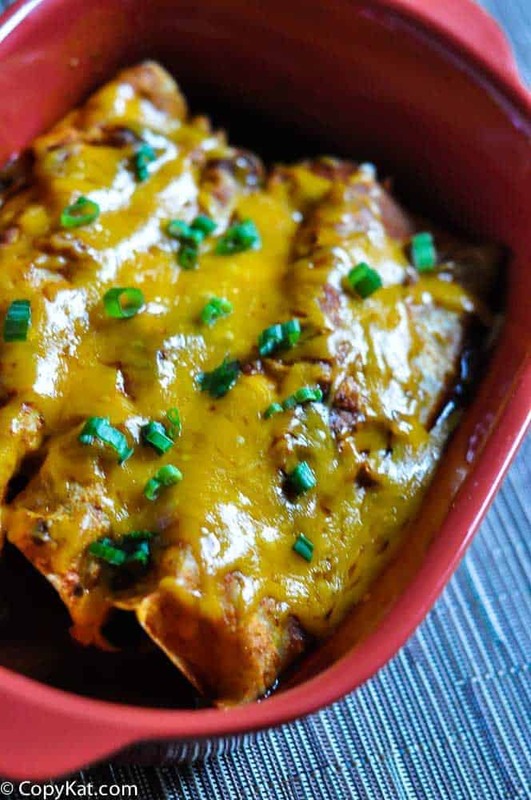 Sour Cream Chicken Enchiladas are perfectly spiced and are so easy to put together. Pour enchilada sauce into a medium sized sauce pan. Place chicken breasts in sauce pan with sauce over medium heat. Add two cloves of minced garlic to sauce. Cook chicken for about 20 to 30 minutes or until the chicken is fully cooked. When chicken is fully cooked remove from saucepan. Shred chicken chicken and place in a bowl. Season with salt and pepper. Add sour cream to cooked chicken. Stir to mix well. Preheat oven to 350 degrees. Add about 1/4 cup of chicken mixture to a tortilla. Roll tortilla and place in a baking dish. Repeat until you fill a 9 x 13 inch baking dish. Ladle sauce over enchiladas. Sprinkle with cheese. Heat for 10 to 15 minutes or until the cheese has melted. HI Stephanie what size tortilla are you using? and will corn tortilla work as well ? I am using the smaller size, I am going to guess they are about six inches across. I think it would work ok with corn. Love new uses for chicken! And totally love me some enchiladas! Win! I’ve been craving enchiladas lately, so I may need to put this recipe on the list soon! Yes please. Want want what. My guys would go absolutely nuts over this. It is comfort food at its finest.